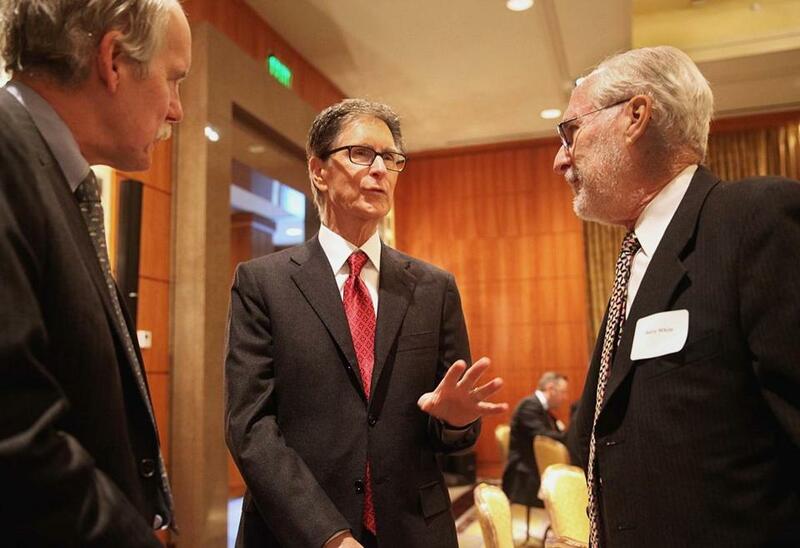 John Henry (center) spoke with Robert Gallery of Bank of America (left) and Barry White during a Greater Boston Chamber of Commerce breakfast meeting at the Mandarin Oriental Hotel in Boston on Wednesday. Boston Globe owner John Henry pledged to help make the newspaper and its websites “aggressively relevant” and successful in the coming years during a speech to a Greater Boston Chamber of Commerce breakfast Wednesday. Henry cited recent hires of a Vatican correspondent and a senior advertising consultant on the business side as examples of his commitment to growing readership and revenues. “In today’s world, you have to focus on the things you’re really good at,” Henry said. In response to a question about how he would protect journalistic integrity amid his business efforts, Henry said there was a firm wall between the newsroom and the Globe’s business side. Allen will be a correspondent focused on the Catholic Church and will explore the launch of a Globe website dedicated to coverage of the religion. “Part of my job is to ensure that that remains,” he said. Henry raised the issue of why so few advertisers appear in the paper’s sports section, despite a large readership. He said the Globe would launch new approaches to increasing advertising as well as inviting companies to use ad pages in different ways. Henry added that he plans to hire a chief operating officer. He also announced a new program to give subscribers vouchers to direct to their favorite nonprofits. Those charities will in turn be able to use those vouchers to advertise in the Globe. In addition to growing the Globe’s online presence, Henry said he would launch content on Globe TV. He restated his commitment to increasing print circulation as well. “We think the morning paper is one of the best experiences of daily life,” he said.